Villa Hiwa is a three bedroom tranquil garden retreat. 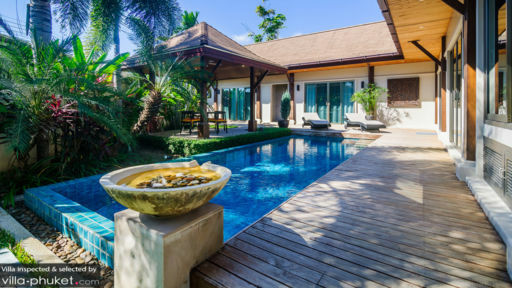 With its lush green palms and plants, airy and spacious bedrooms, and its proximity to Nai Harn Beach and other establishments, Villa Hiwa is the perfect getaway for those who want to experience living in peace and tranquility in one of Thailand’s hottest spots. Come and have a relaxing vacation with your family and friends here at Villa Hiwa! Villa Hiwa has one comfortable master suite that is perfect for couples. Decorated with wooden east asian-like furnishings, this room is also equipped with a canopy king size bed. Here you will fall into a deep and peaceful sleep. In the mornings, if you feel that you do not want to get out of bed just yet, you can turn on the LCD TV and enjoy some shows. For your ease and comfort, this room is also equipped with a clean en suite bathroom with its own tub. Aside from the master bedroom, there are two guest bedrooms in Villa Hiwa for guests to get complete rest in. These rooms are equipped with plush king size beds where you can get a good eight hour night sleep. Both of these rooms also come with bright and clean en suite bathrooms where you can bathe in privacy. Bright green palms and trees pepper the white walls of the quiet garden space of Villa Hiwa while the 8 meter swimming pool glistens under the warm sunlight. You will not help but want to take a dip in its refreshing waters. After swimming, you can rinse off in the outdoor shower and lay on one of the two comfortable sunbeds by the wooden pool deck. You will drift off into a nice nap in no time as you let the breeze and quiet lull you. In the evenings, have a pleasant dinner with family in the outdoor gazebo, soaking in the night atmosphere. Right next to the outdoor sun loungers is Villa Hiwa’s living area. The space has white washed walls, different art pieces, and a cosy open-plan set-up that makes this an ideal area for relaxing with family and friends. The lounge area has two plush sofas where guests can lay back and watch an entertaining show on the flat screen TV. You can also feel the soft fabric of the rug in between your toes as you set down a steaming mug of hot coffee while in deep conversation with your loved ones. In the fully equipped Western kitchen you can prepare a variety of delicious meals. Then you can enjoy your creations on the wooden dining table. Here at Villa Hiwa, the staff will strive to make your stay a comfortable, enjoyable, and memorable one. There is housekeeping service to ensure that your surroundings stay clean and comfortable. What makes a stay at Villa Hiwa even more enticing is that there are a variety of services on offer that will ensure that you have a wonderful time here. These services include: WIFI access throughout the villa, complimentary toiletries, and a welcome pack upon arrival. 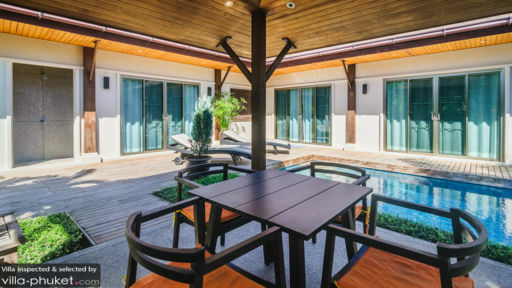 Villa Hiwa is located in a private villa compound in Phuket, Thailand. 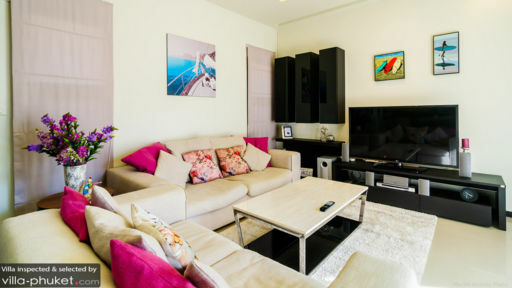 Within the villa’s vicinity, three minutes walking distance away, are a variety of restaurants offering different cuisines such as Thai and Italian food. If you ever want to laze around on the sand or dip your toes into the ocean, Nai Harn Beach is only a three minute drive away. There are also other beaches, such as Kata Noi Beach and Kata Beach that are within six kilometers of Villa Hiwa. Within 600 meters of the villa is a Family Mart, a massage place, and a gym.